Handsome Dan & Jay Baca tie a bow on Season Two of Lucha Underground by handing out the Second Annual Lucha Underground Year-End Awards! Jay’s good friend Sam joins the conversation as they hand out awards like Feud of the Year, Newcomer of the Year, and the top honor, Most Valuable Performer. Find out which of your favorite luchadores are taking home the hardware. You don’t want to miss episode! Lucha Underground Season Two officially ends TONIGHT! Full coverage of Part Two of Lucha Underground’s mega event, Ultima Lucha Dos. This week’s review leads to other interesting discussions. Only one episode of Lucha Underground after this. You don’t want to miss out on this thorough analysis from WLW Studios’ “Lucha Liaison” and the Smartest Man Not In Pro Wrestling. Time to raise your Wrestling IQ! WLW Studios’ “Lucha Liaison” Jay Baca joins Handsome Dan for a review of this week’s Lucha Underground episode then sticks around to discuss the Hall of Fame. 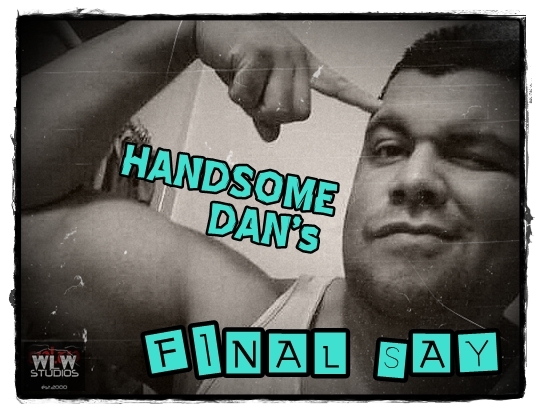 Plus, Handsome Dan cuts a promo on the haters who seek to challenge his wisdom. You don’t want to miss the Smartest Man Not In Professional Wrestling puttin’ hos in check! Time to raise your wrestling IQ! Handsome Dan tries to sort through the hoopla surrounding the return of Shane McMahon. Plus, Jay Baca joins us for a review of this week’s episode of Lucha Underground. And for the first time ever on the Final Say, Mike Noringonger of the Midnight Jury weighs in with his thoughts as well. You don’t want to miss this landmark episode! Handsome Dan gives his thoughts on Daniel Bryan’s retirement as well as the reports that Wade Barrett has asked for his release from WWE. Plus, “Lucha Liaison” Jay Baca joins him for a review of Episodes 3 & 4 of Lucha Underground Season 2. Get your game faces on, it’s time to raise your IQ! Lucha Underground Season Two is officially underway and “The Smartest Man Not In Professional Wrestling” and his “Lucha Liaison” Jay Baca are here to give you the complete breakdown. Put on your thinking caps and come get your Lucha on!